With one round to go, six of the eight playoff places in the French “Elite 1” have been decided, with three teams competing for the final two spots. In Poule 1, top team Montpellier played second placed Blagnac in front of around 2000 spectators and the TV cameras of Eurosport. It should have been a close game, but Montpellier won with ease. 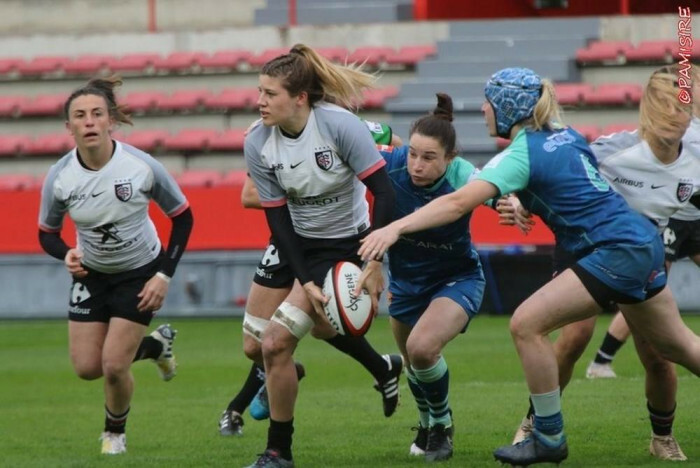 Fantine Baccichet and Caroline Boujard both scored hat-tricks of tries, and Marine Menager added two of her own, with Blagnac only scoring late in the game. Despite the defeat, Blagnac – who have won all of their games other than those against Montpeller – have also qualified for the playoffs alongside Montpellier. The final two places from Poule 1 will be decided between Romagnat, Rennes and Stade Francais who go into the final weekend separated by just two points. The former two clubs met last weekend in Rennes, where a win for the home team would have confirmed their playoff place, but it was the players of Romagnat who came away a win that puts them third in the pool. ASM Romagnat will host bottom club Villelonguet next weekend knowing that a win will guarantee a first ever place in the end-of-season championship playoffs. Rennes, on the other hand, have a slightly trickier trip to Lons, who lost 21-7 to Stade Francais last weekend. Crucially Stade missed out on the try bonus, and therefore require not only a win at Blagnac but also need one of the other two teams to slip up. Meanwhile in Poule 2 all four playoff places are now decided. Toulouse ended Lille’s hopes with a 39-5 win – also broadcast live on Eurosport – which means that Toulouse also confirmed that they will end the pool stage at the top of Poule 2. Second placed Bayonne took on third placed Bobigny, but the outcome was a seven tries to one 44-10 win for Bayonne. Nonetheless both teams are into the playoffs, and will be second and third. Finally Grenoble became the only club from outside last season’s Top 8 to reach the quarter-finals with a tense 10-5 win in Bordeaux.